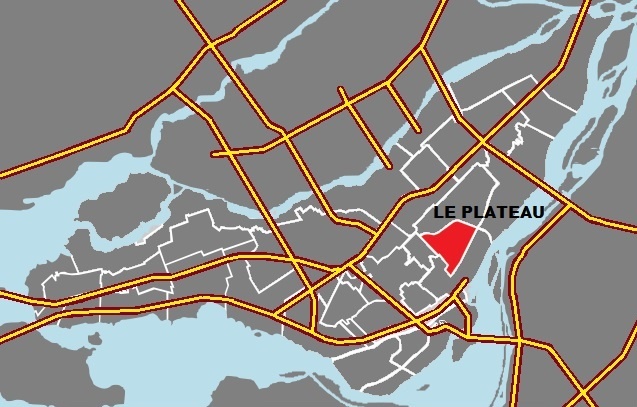 Le Plateau is a rather small area (a neighbourhood) of Montréal – but whose population constitutes, as a geographic area, one of the most powerful poles of influence in Québec media, social movements, and Québec (and thus Canadian) politics. This little piece of land gets a LOT of attention. Canada has very few other examples of such a small area being so influential in so many sectors of society. 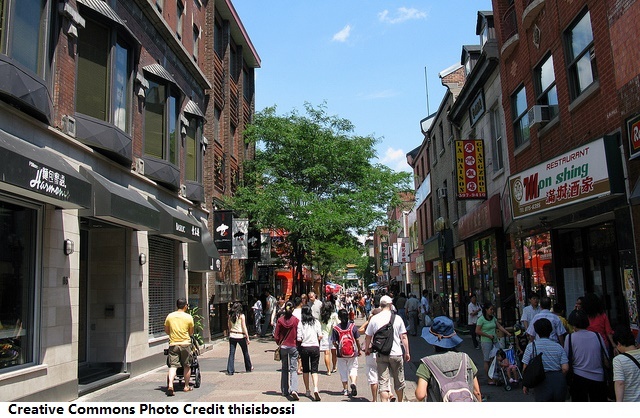 Le Plateau is primarily a Francophone neighbourhood, however it also encompasses two Anglophone enclaves within its borders, each being only several blocks in size: “The McGill Ghetto” and “Mile End”. As an administrative entity, it is classified as a “borough” (or arrondissement) – a decentralized administrative district within Montréal City (the local borough council has a number of decentralized powers over administration within Le Plateau). As a geographic entity, Le Plateau comprises only 8 square kilometres, with approximately 100,000 residents. It is roughly located between ave. Sherbooke as the Southern boundary, the CP rail tracks as the Northern boundary, ave. du Parc (at the foot of Mont-Royal) as the Western boundary, and rue Iberville as the approximate Eastern boundary. In the Québec provincial legislature in Québec City, it is known as the riding of “Mercier” — which generally has the same boundaries as the city administrative borough. It has been held by Amir Khadir of Québec solidaire since 2008. Prior to that, with the exception of only two years, it was held by the Parti Québécois since 1976. In the Federal parliament in Ottawa, Le Plateau comprises the Northern half of the “Laurier-Sainte-Marie” riding. It has been held by the NDP since 2011. Prior to that, since 1990, it was held by the former leader of the Bloc Québécois, Gilles Duceppe. 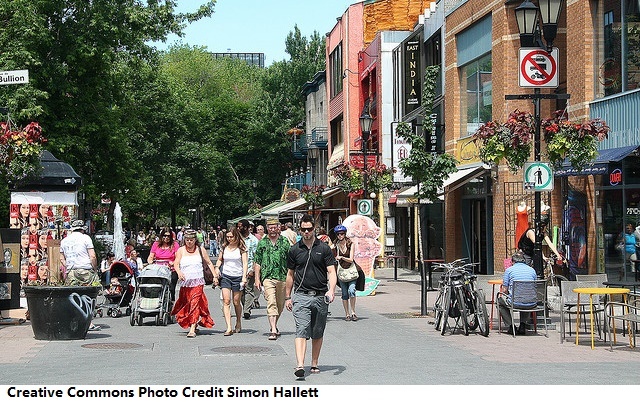 Radio-Canada recently published an article using statistics to test traditional stereotypes of residents of Le Plateau: “Les bobos du Plateau existent, en voice la prevue” (“The Plateau Bohemians exist – here’s the proof”). You can read the article HERE. A “bobo” is difficult to explain in English. It can be pejorative (not a very nice word), and rather politically incorrect. The article didn’t delve much into the meaning of the word in the plateau contact, but a “bobo” is a BOurgoeois BOhemian. The expression has found its way into Québec vocabulary over the last decade (there’s even a television sitcom on Téléquébec named “Les Bobos”). In a French context, I believe the word was originally used to describe someone from Paris’ East end in France (but don’t quote me on that). The “bourgeois” part means a higher income bracket group. The “Bohemian” aspect has a more cynical and pejorative meaning, within a metaphorical context of traits (a combination of any or all of the following): granola, hipster, counter-culturalists, elitists, tree-hugger, organic lover, dressed non-flashy but trendy in earth tones, yoga practitioner, (younger) singles, double incomes no kids (DINKS), professionals, sneaker-wearing tech-savvy nerds, garden growers, art lovers, wine sippers, stage-theatre goers, intellectuals, book readers, bike riders, book writers, wine drinking. Has the highest concentration of people working in the arts, culture, sports and leisure (the arts and performance district is across the street from the southern boundary of Le Plateau). The article is generally making the point that many of the statistics fit the demographics of the stereotypical “Bobo”, and corroborate many preconceived notions people elsewhere in Québec may have of Le Plateau. (again, it’s a rather un-PC article in that respect). Interestingly enough, may of the areas in Montréal with statistics at the “opposite end” of the scale were found in Montréal’s westernmost Anglophone districts, or Montréal’s easternmost Francophone, blue-collar districts (more context about these two districts can be found in the post “Québec Trends in Bilingualism” . Anecdotally, I have two very good friends who live in Le Plateau, both Anglophone. One, a young doctor, has been a close family friend since we were small kids 25 years ago, growing up in rural Alberta together — married to her French husband from France, no kids. The other I’ve known for over 10 years — from China, who was one of my best friends when we both lived in Beijing, and who immigrated to Canada several years ago – holds two arts degrees, single, and self-employed in the computer animated graphics industry. One very much comes from an earthy “environmental” family, and the other is from one of China’s most academic families (his grandmother was China’s first psychologist, and 3 generations in his family are all university professors and speak fluent English). These two people have many friends like themselves who also live in Le Plateau, both Francophone and Anglophone. I wouldn’t call them snobby (they wouldn’t be friends if they were). But I believe they moved to Le Plateau because they felt it fit their personalities and lifestyles. In the most general of terms, supporters of a combination of (1) sovereignty, and (2) the far left, and left-of-centre parties are generally Francophones (Anglophones rarely support sovereignty, and generally support the more centralist liberals, with some supporting the right-of-centre CAQ). Francophones in many regions elsewhere in Québec also support the Liberals, as well as the right of centre Coalition d’avenir du Québec (CAQ), the Conservatives in some regions, and the Parti Québecois (PQ). Politics in Canada seem to flow on a pendulum, most often between 3 main provincial and federal parties; all playing a role in influencing how fast the pendulum moves and its direction (in Québec, it becomes a bit more complicated with 4 federal parties, and 4 provincial parties, causing vote-splitting and, as a result, strategy-intensive politics). Politics in Canada can be quite fluid, and Canadians (including in Québec) are less apt to be “born” a life-long political stripe – preferring to adjust their voting habits based on what they feel the situation calls for at the time of a vote. However, political leanings in Le Plateau are much more weatherproof against pendulum swings than in other ridings in Canada. Because Québec’s more complicated political scene requires much more strategy than elsewhere in Canada, it is sometimes anybody’s guess which way many ridings will vote. This is why Le Plateau has become one of the most important ridings in Québec, and possibly in Canada. I’ll explain. If you’re a party which feels you could be on the losing end of the pendulum swing, you will want to ensure your party’s biggest stars and leaders nonetheless keep their seats, enabling your party to remain in the news and keep your cause alive until the next election. That way, if your party loses other ridings, you will still be in the spotlight, and your cause will continue to be on air during the period running up until the next election. Federally, prior to the riding being ceded to the NDP in 2011, Le Plateau used to be a sure-fire win for the Bloc Québécois. Thus the riding used to be reserved for its former leader, Gilles Duceppe. Provincially, it was also seen as the best chance for Québec Solidaire to gain a seat and subsequent attention – the QS reserved their riding for their star-candidate, Amir Khadir (QS is a sovereignist party — the closest active political party in Canada with Marxist-Lenninist social principles, much further left than the NDP, Bloc, or PQ). Khadir’s election in Le Plateau gave the party unparalleled attention in the media for many years – enough to keep the party on the radar until the next election cycle, which contributed to QS leader finally gaining an additional seat in the National Assembly years later, and splitting the sovereignist vote between left of centre Parti Québécois, and the far left Québec solidaire (this had huge implications for the Québec sovereignist cause — creating a large degree of disarray in the sovereignty movement, and was one of the contributing factors of how the Liberals’ secured a majority win in the last election). Le Plateau is one of the most die-hard “left” and “left-of-centre” ridings in Québec and Canada. Without Le Plateau, leftist parties may not have been able to maintain the same degree of media coverage in Québec, year after year, in the face of changing voter demographics and tendencies. Thus, Le Plateau plays a very important role in Québec politics by keeping alive a high-profile political counter-balance to the Liberals, CAQ, Conservatives and former ADQ. If pitting “Right against Left” in Québec could have a face, it could be said it’s a story of “Québec City / La Beauce” against “Le Plateau”. In an earlier post, “Maurais Live”, I touched upon some of these “Québec City vs. Montréal” political dynamics. In Centrist-voting regions of Québec (and there are many), and Right-of-Centre voting regions of Québec (primarily Québec City, La Beauce, as well as occasionally in Saguenay-Lac-St-Jean), there’s a tendency to refer to the Left movements as “La clique du Plateau”. I’m not sure who coined it, but this is an expression which is being repeated more and more often. You’ll hear it on talk radio, you’ll see it in independent commentaries in newspapers and magazines, and you’ll see it in blogs. However, the expression “La clique du Plateau” is something you generally will not hear on television. The reasons why is a somewhat touchy and controversial matter. When trying to explain the possible reasons, there’s always the risk of incorrectly painting everyone with the same brush, just as there’s always a risk of overgeneralizing when talking about this subject. Therefore, I’ll try to keep the following as general as possible without too much overgeneralization. I’d prefer to leave it to readers to form their own judgments in their own free time. My recommendation is that you pick 3 of the most popular programs of each of the 3 most popular networks (mix it up between variety and information programming), and see for yourself if you do or do not agree with the critics (I don’t feel it’s my place to formulate judgments for you). There are segments of independent media (those who do not have relations with the major cable networks), such as talk radio, magazines, independent columnists, etc., who regularly comment (and complain) that specific TV network program hosts, specific popular TV programs, specific producers, and to an extent, some network owners, have a political agenda which becomes evident in their programming. The accusations are that the agendas are either too far Left or too Sovereignist; most often leaning in the camp of Leftist-Sovereignist. I can think of several programs for which I know I will see political biased programming when watching them (these types of programs can be found across almost all major networks — AND Anglophone television is NOT exempt from this phenomena either… there are numerous Anglophone television programs I can think of which are quite far right, quite far left, and which also appear in denial of Canada’s linguistic dualities). The bias which critics point to is not necessarily obvious if you were to watch a single episode for the first time (ie: show host will not overtly say they support specific ideologies, nor will they tell viewers how to vote). But the accusations from critics allege that bias surfaces as part of a regular pattern of repeatedly propping up left-leaning or sovereignist-leaning personalities or issues, while the hosts continuously criticize (or allow their guests to criticize) centrist, right-leaning, and / or federalist viewpoints. Say for instance you watch a specific popular variety show, or a specific popular TV talk show program – one which has tens of thousands, if not hundreds of thousands of viewers per episode. Imagine a mix of guests, show after show, of people from all political stipes (politicians, celebrities, others sectors of society with political viewpoints). At first you would have the impression that the show is making an effort to be well balanced and you would not necessarily think it is biased. But then imagine, during each show, the most difficult, embarrassing, critical questions are constantly posed of center, right-of-centre, or federalist guests, and the easiest questions (or hardly any questions at all, but rather a friendly jovial discussion) are reserved for left-leaning and / or sovereignist guests. If you were to see this same pattern after 10, 20, 50 programs, or 500 programs, you would begin to harbour more than a few suspicions that there is a political agenda to the program. Now, imagine if it’s a variety show which is not supposed to be political in nature (ie: it mainly features musicians, or other non-politicial personalities), but it is turned political through the hosts’ lines of questioning – thus turning an A-political show into one which promotes a political bias. Fortunately, if this type of bias does exist, I do not believe that it is inherent in the majority of television programs (it would be limited to just a handful, or even fewer, interview and political commentary shows). In theory, regardless of my own political stripes, objectively speaking, I have absolutely no issues with a certain degree of politically biased programming. It makes people think, it brings new views to the table, it gives a voice to certain elements of society who may otherwise not have a voice. But the biased-programming controversy which is being discussed in Québec right now pertains to the size, extent and concentration of programming which consistently portrays an “appearance of bias” – apparently with the same leftist-sovereignist political stance in just a handful of media circles. One of the “green” alleys — Pretty, eh? 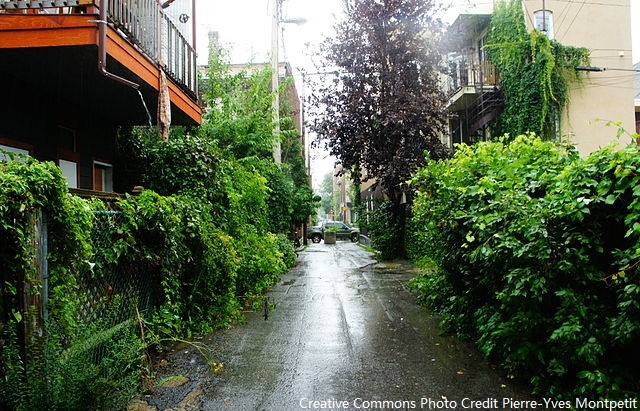 Part of a city-driven initiative to turn little alleys like this into an oasis for residents. Some of the alleged bias is very subtle and nuanced. Take for instance some of the most popular programs in Québec, drawing in hundreds-of-thousands, or even millions of viewers per episode, but it is alleged they make absolutely no references or allusion to Canada (be it certain types of talent programs, reality programs, or news interview programs). Where there would be a Canadian flag in a shot of the city in the background, cameras may be re-positioned to avoid showing the Canadian flag. Where there might otherwise be talk of a guest singer’s recent concert tour of parts of Ontario, the host may prefer to only speak about Québec tours in Gaspésie (despite the Ontario tour being much more significant). In these examples of soft-biased programs, anything Canada-related tends to be completely eradicated, and the word “Canada” even becomes taboo (even to the extent of labelling a Francophone artists from Ontario as simply “Francophone” rather than Franco-Ontarian). Now that I have said that, let me flip the coin a bit and give you a different perspective… when you watch Anglophone television, you will often see national reports relating to an event or belief that is portrayed as being wholly Canadian – but perhaps it is different in Québec, yet Anglophone television will give it no mention. This type of more subtle bias, or “bias through omission” can be very dangerous when it infiltrates the most popular entertainment programs. Pop-culture forges a national identity, a feeling of belonging, of being able to relate to your compatriots, as well as being empathetic of them. If you deliberately ignore out of existence your compatriots from other parts of the country, or ignore out of existence Canada, then your feelings of attachment and solidarity with those compatriots, or Canada, slowly whittles away with time. It’s basically social engineering through the soft-power of the media. On the Québec front, should there one day there be another referendum, the influences of such long-term soft-power could affect the results. On the Anglophone front, it’s difficult to build a feeling of solidarity and comradery with your Francophone compatriots if they too are given little attention in Anglophone media. In a Québec context, this is alleged bias is where the expression “La clique du Plateau” finds its origin. I’m not sure this is an entirely fair term – but critics have coined this term because they say that far Left-leaning and / or Sovereignist producers, hosts, and guests of the programs in question often live in Le Plateau district of Montréal. 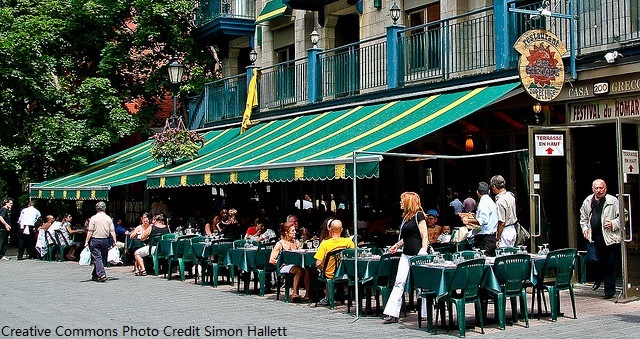 They are often seen dining, shopping, or having coffee in Le Plateau. They invite one another (and the same group of perhaps a few dozen Québec personalities) onto each other’s programs, and they seem to keep the programming in a tight knit circle – a “clique” if you will. The headquarters and studios of Québec’s major television networks, for the most part, are also physically situated very close to Le Plateau. Thus, the innuendo is that employees, writers, researchers, administration, managers, those with authority over financial decisions, and program directors also live in or around Le Plateau. This reinforces the notion of a greater “clique”. These are very broad generalizations, and they should be taken with a grain of salt. It’s dangerous when you begin to paint everyone with the same brush. However, I feel it’s important to describe what critics are referring to so you understand what they mean when you hear the expression “La clique du Plateau”. The critics continue by saying these same programs often take aim at independent media. For example, the right-of-centre Radio X, has repeatedly been publicly labeled “Radio poubelle” (garbage radio) for being critical of programs it associates with La clique du Plateau, be it Radio X’s criticism of certain programming on Radio-Canada, TVA, Télé-Québec, or V.
For many Anglophone readers, it may come as a surprise that elements of Québec society would be critical of Radio-Canada for being grouped in as part of La clique du Plateau. However, Radio-Canada takes some of the biggest criticism in this sense from various elements of society – the argument being that the journalistic and programming freedom (which must be upheld) has allowed some aspects of programming to be highjacked by La clique du Plateau. The catch-22 is that these aspects of the alleged clique du Plateau have created and produced some of the best value-for-entertainment programs in Québec (translation: $$$ for the network). Thus, for the simple fact of ratings and badly needed dollars, it would probably be difficult for senior management in Radio-Canada to correct any political-biased programming on a network which is supposed to have a Canadian nation-building mandate. If these criticism are true, it must be a complex scenario for CBC / Radio-Canada’s senior management to contend with – having to safeguard journalistic & programming freedom (which is paramount), balance that with network revenues, allthewhile implementing a pan-Canadian “nation building” mandate, and trying to avoid a backlash from important sectors of their viewership. I will say that compared to 3 or 5 years ago, I have noticed what appears to be a more active move on the part of Radio-Canada to provide more national, pan-Canadian news coverage on their news network and national news programs, and overall, the hallmarks of personal agendas (be it sovereignist, federalist, left, right or centre) are few – as it should be. Criticisms towards Radio-Canada now generally relate to just a few, very specific (but very popular) programs with specific hosts, than what it relates to the network’s overall general programming. The critics of the notion of La clique du Plateau tend to be much more severe towards Radio-Canada than other networks, simply because Radio-Canada is funded by tax dollars, and unlike other networks (which also do not escape criticism), Radio-Canada has a national mandate to uphold (whereas it’s free-reign for private networks). That being said, critics of the concept of La Clique du Plateau are also taking aim at Federal tax credit subsidies which are being given to private networks – in the tens, and possibly hundreds of millions of dollars per year. Funding cuts at Radio-Canada: Popular media personalities (in fact some of Québec’s most popular television personalities), labeled by critics as being part of La clique du Plateau, are taking direct aim at Ottawa and Canada — and specifically Steven Harper — as being responsible for funding-cuts to their programs. The “innuendo” is that the cuts are political vengeance on the part of the Conservative government, and that Canada as a whole should be blamed for voting conservative. They argue that it shows Canada’s and Ottawa’s lack of understanding of the importance of funding Québec culture (other see these views as a twisting of words when economic matters become politicized by those with an agenda). Critics say that sovereignist elements are now digging in their heels on air and are fighting back by politicizing Radio-Canada’s funding cuts. When confronted with the argument that the English network of CBC is also having its funding cut, the reply from La clique has been that the Francophone network, which has high viewer ratings and is profitable, should not be punished because of the unprofitable operations and low viewership of the CBC. Thus, they counter that Radio-Canada’s cuts are in fact political. (NOTE: I made an addendum at the bottom of this post with some of my personal views pertaining to the budget cuts at CBC / Radio-Canada). The PKP factor: TVA’s majority shareholder-owner is Pierre-Karl Péladeau (PKP for short). He owns Québecor, which owns TVA. His spouse is Julie Snyder. Her production company, Productions J, produces many of the most popular entertainment programs which are aired on TVA. PKP’s run for the Parti Québécois leadership seems more and more certain. He has stated his primary goal is to lead Québec to independence. Most in the PQ believe he is a godsend which could help to re-ignite a dying sovereignist movement. Consequently, the provincial Liberal and CAQ parties say PKP is in a conflict of interest situation (or at least the appearance thereof) as the billionaire owner of what could be up to 40% of Québec’s media and television industry. The provincial Liberals and CAQ have introduced a bill (currently going to committee) in the provincial legislature to force any political aspirants to divest themselves of all shares they, and their immediate family members hold in any media corporations. As you can imagine, this has not gone over well in the ranks of the Parti Québécois (which does not hold sufficient political seats in the legislature to block the motion). You can also imagine that this has not gone over well in those parts of the media which allegedly form part of La clique du Plateau. A proverbial war has been declared, it’s not pretty, and we’re seeing it fought on our television screens. The Liberals and CAQ counter that several years ago the PQ forced David Whissell, a liberal member of the National Assembly, to resign because of shares he owned in a company which gave the appearance of a conflict of interest. Thus, the Liberals and CAQ are arguing “what’s good for the goose is good for the gander”. The PQ counters that it should be sufficient for PKP to simply place his shares in a blind trust for the duration of his political career. The PQ also states that it’s not fair for Julie Snyder to have to give up her media empire, considering she produces some of the most popular programs in the history of Québec and Canada. The Liberals and CAQ retort that placing shares in a blind trust may not change the Hyper-Québec-Centric nature (and thus possibly pro-sovereignist soft-power) of TVA producers, journalists, and staff since they would expect their boss to one day return to work, and thus they wouldn’t want to cross him in the interim. There’s also a new argument beginning to emerge in favor of PKP being forced to divest himself of his stocks — and this time it concerns Anglophone Canada. PKP recently sold the Sun newspaper empire in Anglophone Canada. However, he chose to keep Sun News Television. It’s been reported that Sun News TV suffers from a financial loss, and that it only attracts a small fraction of Anglophone Canada’s overall viewership. Yet PKP has decided to keep the network, a network which could go bankrupt if it were not kept on life-support by Québecor. Québecor (and thus presumably PKP) founded Sun News Television as a far right-wing information and commentary network. The comments of its on-air hosts are often hostile to Québec and directly counter to many of the principles people in Québec hold closest to their hearts. Thus, in Québec media, particularly aspects associated with La clique du Plateau (including certain programs of Sun News TV’s sister-Québecor French media), Sun News TV is held up as a focal point to be attacked as an example of a lack of understanding from a cold, callus Canada. When Sun News TV makes negative reports about Québec, it is cited by the aforementioned media as Québec-bashing on the part of Anglophone Canada, and how Canada is not compatible with Québec. However, what La Clique du Plateau-associated media fails to mention is that it is not “Anglophone Canada” beating down Québec, but rather it’s a Québecor company based in Calgary, financially propped up by PKP’s Québecor media wing, which is bashing Québec. That’s a huge difference. So now the hypothesis being thrown around in Québec political circles is that this was part of PKP’s sovereignist design to turn Québécois off of Canada: ie: create the appearance that Canada hates Québec, is incompatible with Québec, and then give it as much media coverage as possible in Québec. (The other networks in Canada generally don’t have commentaries or opinion programs which say things which come anything close to what Sun News TV says, and they’re not the ones which are generally targeted in Québec media as being hostile to matters important to Québec). It’s another argument as to why the provincial Liberals and CAQ are pushing for PKP to divest himself of his media empire if he is persists in taking over the leadership of the Parti Québecois. Unfortunately, if this hypothesis and what certain critics are alleging is true, then Anglophone Canada, and particularly the far-right elements of the Federal Conservative Party, far right supporters of provincial PC parties, and supports of the Wild Rose Party – the demographics who may most likely support aspects of Sun News TV’s programming — seem to have no idea that they’re being used as pawns in a game which has sovereignist aspirations. I wonder what Ezra would have to say on air about this if he could understand French. I mentioned at the very beginning of this post that the physical area of Le Plateau encompasses two small Anglophone enclaves. One is the “McGill Ghetto”. The other is “Mile End”. Until the mid-1980s, the Northwest end of Le Plateau, known as Mile End, was comprised of factories and warehouses catering to the clothing manufacturing industry (the “rag trade”). Just like Winnipeg’s rag trade district (the warehouse district north of downtown), the industry closed, leaving scores of abandoned, but beautiful brick-faced factories and warehouses. In the 1990s, what was a decrepit eyesore began to undergo a period of restoration. Former abandoned industrial buildings were being converted into shops, work studios, and condos. 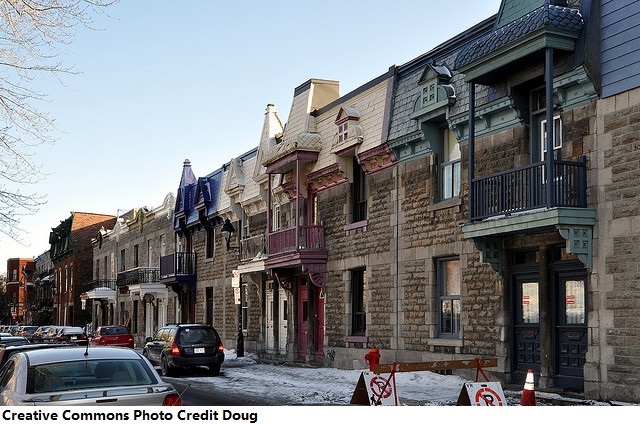 Likewise, the Eastern half of Le Plateau, which traditionally was the blue-collar Francophone district where the “rag trade” and other workers lived, also began a period of restoration and gentrification. Because most of Le Plateau was a relatively poor district, which rapidly fell into decline, and then just as rapidly underwent a period of restoration and gentrification, there was little time for any of the old buildings (often 100 to 200 years old) to be torn down to make way for modern structures. 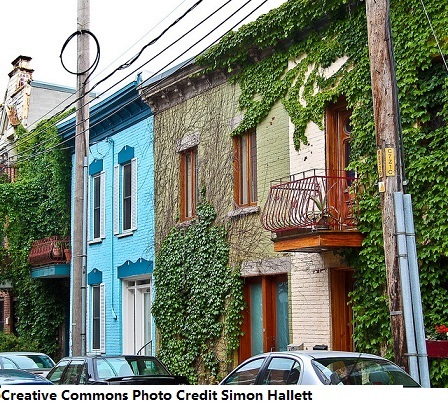 Thus, the appeal of the gentrification process was based in large part of the restored historical beauty of the neighbourhood. 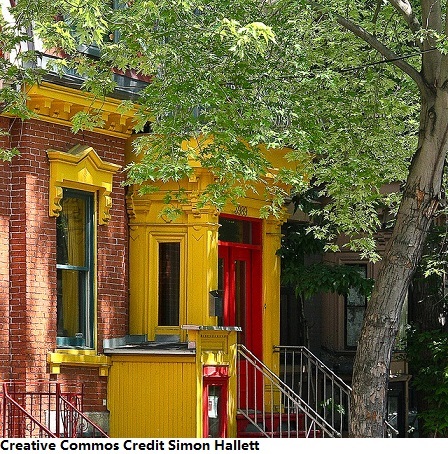 Apart from attracting Francophones, the uniqueness of the neighbourhood held equal appeal to Anglophones, who traditionally never lived this this part of Montréal before. The Northwest corner of the district, known for over a hundred years as “Mile End”, thus suddenly became populated by Anglophones in the 1990s, and particularly in the mid-2000s. There is still a steady influx of Anglophones moving into the Mile-End district today. Anglophones are now, for the first time, starting to also move into other areas of Le Plateau traditionally not inhabited by Anglophones. 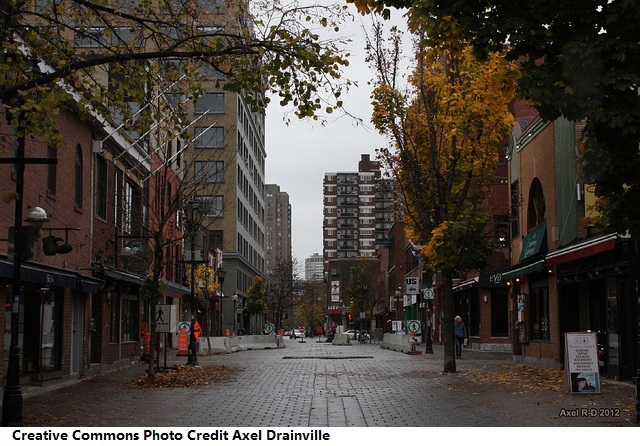 The other Anglophone district, the “McGill ghetto”, is a student district which abuts upon the McGill university campus in the far southwest corner of Le Plateau. Because McGill is an Anglophone university, this area of Le Plateau has always had an Anglophone community of students, professors, and their families. 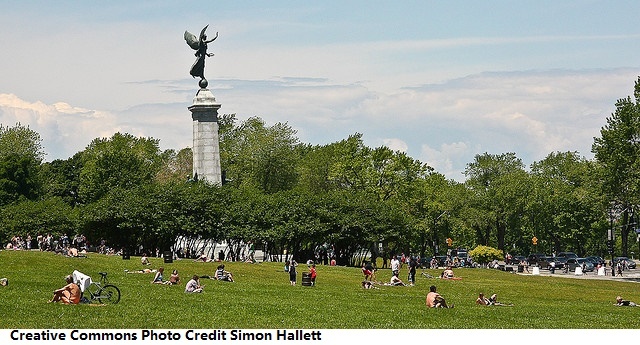 However, historically, the Anglophones associated with McGill have lived further West, outside of Le Plateau – until now. 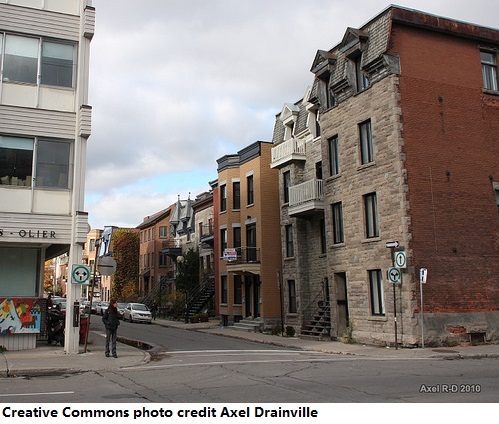 Over the last few years, they’ve been moving deeper into Le Plateau, attracted by the overall beautification and gentrification of the neighbourhood, and its compatibility with university life. Another important trend is the ethnic diversification which is taking place in Le Plateau; Chinese, European, Hispanic, Haitian, Arab, you name it – it’s all happening, and it’s happening quite fast. When people of different backgrounds begin to live together, their attitudes towards one another begin to open up. Anglophones who have moved to Le Plateau often do so from out of province — but they learn French. This effort is seen, and it shows Francophones that Anglophones can be pretty cool too. Add immigrant communities to the mix, a diverse workforce of varying age-groups, and we being to see changes in views — more towards the centre, rather than die-hard left views or die-hard right views. All of this change may have huge political ramifications, not only for the language-politics and geo-politics within Le Plateau itself, but also for Québec politics as a whole – owing to what Le Plateau stands for, and its influence on Leftist, but especially Sovereignst politics in Québec (including leftist and sovereignist-biased television and media programs). It should therefore come as no surprise that the Anglophone influx has not gone unnoticed. There is nothing anti-Anglophone or sovereignist politicians can do to counter the political ramifications which may stem from Liberal Anglophone residents moving to Mile-End. However, PQ politicians tried to prevent Anglophones, living in the McGill Ghetto, from voting in last April’s provincial election. The PQ, backed by high profile media personalities, charged that many or most of the Anglophones living in the McGill Ghetto were not eligible to vote because they were out-of-province students who were only intending on residing in Québec temporarily, and thus would not qualify as holders of documents which prove that Québec is their place of permanent residence. Legally speaking, the authority to make such a call resides with the election bureau. At the time, the opposition Liberals asserted there was nothing the PQ government could do. In the end, it was agreed that the election commission did have sole jurisdiction in ensuring voters met eligible requirements, and in the end more Anglophones voted than what the PQ would have wanted. There was a good deal of bitterness left over from this episode in a number of circles (but fortunately, incidents involving language-politics, such as this, are not common — and seemed to only flare up during the 18 months the PQ was in a minority-government position. The divisiveness of that whole period was enough to even turn a portion of the sovereignist electorate away from sovereignty during that particular election). However the point was made – the demographics of Le Plateau are changing. It has the potential to send shock-waves through Québec’s political establishment. If Le Plateau, the bulwark and bellwether of Leftist and Urban Sovereignist politics falls, it’s possible that the entire foundations of the Sovereignist movement could, in part, crumble on many levels. The Sovereignist movement is already in a very difficult position, with support lower than almost any other time in modern history. This is why PKP, and the matter regarding his media empire is being given so much attention by both Sovereignists and provincial-level Federalist politicians in Québec. If the Sovereignist and far-left movement lose Le Plateau, if Le Plateau’s connection with Québec media begins to sever due to a new demographic in town, and if PKP loses control of his Le Plateau-based media empire (or if he declines the PQ leadership in order to keep his media empire), serious questions will be raised as to whether or not the sovereignty movement will survive as a force in near-future politics. I should add a word of caution that journalists in Québec should not be painted with the same brush. I’ve seen excellent journalism and commentaries. I’ve seen professionals, known to have die-hard views covering all end of the political spectrum, maintain the most admirable degree of neutrality. I’ve also seen many many journalists whose work is so well-rounded and exhaustive, that you would never know their personal political views. These journalists should be commended, and are not those who are being referred to when aspects of society refer to La Clique du Plateau. The Radio-Canada Ombudsman once said that the Ombudsman’s office often receives multiple complaints alleging personal political bias in a particular interview or news segment, but the complaints come from all sides (ie: sovereignists may feel the segment had a Federalist bias, Federalists may feel the segment had a Sovereignist bias, the Left feels it had a Right bias, and the Right feels it had a Left bias). I think that’s quite telling — and means that you really have to view the news with a very open mind, allowing yourself to be open to different perspectives when viewing topics which matter to you. It basically says that during times of electoral campaigns, referendums, controversy or emotion are involved, viewers tend to view programs through the lens of their own points of view on the topic, thus resulting in accusation of bias, towards the same segment, from all sides of the equation. The cuts at Radio-Canada are gaining more attention in Francophone media – much much more attention than cuts at the CBC have garnered in Anglophone media. As for my personal opinion regarding the cuts, I do not know if they are or are not political. If they are, it would be very sad. But I will say this, and it is my personal opinion: Regardless if there is the odd program which does have a political overtone, I don’t believe that it would be reflective overall of the network as a whole or the people who work there. We see amazing work coming out of Radio-Canada. It is a vital institution for those of us across Canada who transcend the linguistic lines. It is equally vital for Francophones across Canada, as well as being a national institution which enriches the cultural identity of Anglophones. I personally am against the cuts. If the issue revolves around Radio-Canada’s lack of providing more comprehensive pan-Canadian programming, and then rebroadcasting that programming to every home in Canada, including in Québec (in order to live up to its mandate as a truly Canadian broadcaster), then give it more money, not less. If the issue revolves around a lack of joint CBC/Radio-Canada ratings, then find funding mechanisms so they can increase their appeal in order to bring in more ratings (that takes money, not less). If the powers that be feel it should be moving to the web, then give it the money it needs to make that transition. If the issue truly is an across-the-board budget cut by a predetermined amount (ie: we’ll chop 20% from CBC/Radio-Canada just because we need to save money), then take a second look at the issue, see if there are important matters which were overlooked, and see if there are alternative solutions. Sometimes the best solutions are in things neither side previously thought of. This one budget cut is getting more attention than almost any other, regardless of political stripes — there are perhaps reasons why. That’s worth a second look. I understand perfectly that networks around the world, be it private or public (ABC-Australia, BBC, some US private networks for example) are cutting their budgets – especially in an age when things are moving to the web. But the cultural nature of Radio-Canada makes it different from these other types of networks. It is the voice of a people, of a language and of a country. The fact that it is in French, in a unique environment, with different challenges does give it a different meaning. It is so much more than only an entertainment or arts venue – it is synonymous with a collective identity. At the end of the day. If cuts are going to be made regardless, I just hope they will be done smartly, with consideration to the context in the above couple of paragraphs. By Quebec Culture Blog 101 in Political Related on October 31, 2014 .